B-Air Dryers is the answer to your Pet Grooming and Drying needs. From Safety, Design and Function, quality has always been foremost.Regardless of the model you choose, the ability to dry and groom your pets safely, efficiently and easily is the end result. An adjustable air flow gate cage hanger adapter allows air flow to be controlled at the cage. 2 hp motor, 131 CFM, 7.4 amps. Includes 6' hose, 3 nozzles & easily replaceable filter. 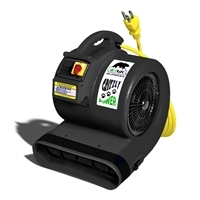 Powerful 2 speed 115V motor. Strong 30000 fpm. 10 FT Cord. High impact ABS construction. Versatile 3 speed, 1 hp, 3,550 CFM. Only 12.8 amps at room temperature. Optional Den Drying Attachment Kit allows simultaneous drying of up to three cages.